I started writing this post on Thursday night at like ten o’clock at night, when I thought I had a good two hours of functional time left in my day. I underestimated what sitting on a raft floating on the American River all day for close to twice as long as usual would do to my functional couch time, and here it is Saturday afternoon and I’m just finishing up this post. 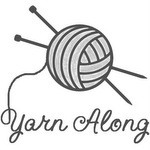 I think that the saga of my misadventures on Thursday is worth keeping, though, despite the fact that it has absolutely nothing to do with the book this post is supposed to be about. I had such great plans for today. I was going to get up early and start working on my blog post, then I was going to go floating on the American River from 12:30 till 4:30 or so, then I was going to come home, finish my post, eat dinner, walk the dog, start laundry, double check my post for obvious spelling and grammatical errors, then post it. That is not exactly what happened. So, true to form on my first weekend day, I slept longer than I planned on. The floating party didn’t put into the river until well after two in the afternoon because of some, let’s say, “technical difficulties” with our first launch site that involved a strong wind blowing in the wrong direction, an octagonal river floatation device, and a slow current. And let’s not forget that the sun sets at 7:30 right now. Because of the slow current and the wind, our three mile float that usually takes us three to four hours took us over five hours to finish today. So I didn’t get home until almost nine, ate dinner, and now here it is 10:15 and I’ve got just about nothing to post, except two short paragraphs about what I did all day long instead of being productive. The Great Glass Sea was a 2014 Indiespensible selection, and I really expected to enjoy it more than I am so far. I’m about a third of the way through the book, and I keep finding other stuff that I’d rather be doing (like laundry) than reading it. This book would fall into the genre of speculative fiction, I think, because its setting is Russia, approximately present day, in a world very much like our own, but with a few notable exceptions. In this case, it seems that Russia is an oligarchy, but a capitalist one (I think), and some business tycoon has begun building a giant greenhouse in Siberia, and has sent satellites up into space in order to reflect the sun’s light around the curvature of the earth in the nighttime so the plants in the greenhouse (and everything else in the vicinity) are constantly exposed to light, so they’ll grow better, faster, bigger. There are, of course, some surprises associated with life in constant daylight. First off, the roosters don’t crow anymore, because they have no idea when to do it. All kinds of other things go on as well, but that’s the only one I can think of off the top of my head. The major characters are a pair of adult twin brothers: Yarik and Dima. They have historically been as close as any twin brothers could possibly be, but at the start of the novel things are changing between them: Yarik gets promoted to foreman at the giant greenhouse (or Oranzheria), and Dima quits his job there. The novel is told in third person limited with shifting perspectives between Dima and Yarik. There are quite a few flashbacks to Dima and Yarik’s childhood, especially back to the time where the boys stayed with their uncle Avya out by Lake Otseva while their mother was recuperating from the loss of their father/her husband in the area mental hospital. I’m having a hard time figuring out where this novel might be going, if you want to know the truth. I’m not sure if anything is going to happen besides that Dima and Yarik are going to grow apart. If so, I’ll be a bit disappointed. Weil is spending quite a bit of time creating this alternate present day Russia, and if he doesn’t delve more into that, I think that making this world will have been for naught. Dima and Yarik’s story could take place anywhere at this point. Something has to happen that makes it unique and special. By it I guess I mean their story as well as the novel itself. The novel is well-written, and each chapter has a lovely ink line drawing by the author himself, but so far I have no idea why it was chosen to be an Indiespensible book. I suspect I’ll figure it out soon enough, if only I had time to sit and read it! In the last few pages I’ve read, it appears that something is going to happen. Dima has taken up with some folks who are not Oranzheria employees. In fact, they hate the Oranzheria and everything it stands for. They have just had Dima meet them in a rail yard, forced him to drink hallucinogenic mushroom tea, and now they are riding on the railroad tracks on some sort of skateboard. I think Dima may end up becoming a member of some sort of resistance movement. So, hooray! Weil is going to make use of his fascinating setting to advance the plot. I knew all along that he would. 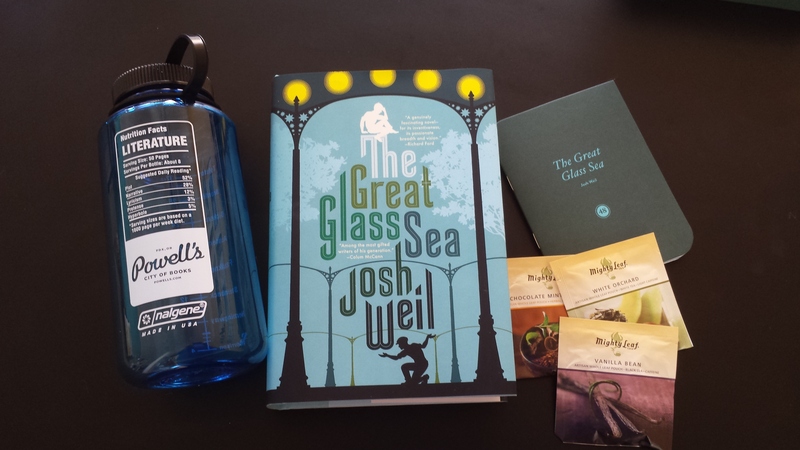 The picture above is one of all the stuff that came in the box from Powell’s when I got The Great Glass Sea last summer. Thanks to thanksmrpostman.wordpress.com for taking the picture so I didn’t have to! This entry was posted in Fiction - Dystopia, Fiction - general, Fiction - literary, Josh Weil, Reviews by Jill. Bookmark the permalink. That author totally stole the idea about the reflective satellites in space and 24/7 daylight from Newt Gingrich. That was one of his campaign promises in the 2012 election.